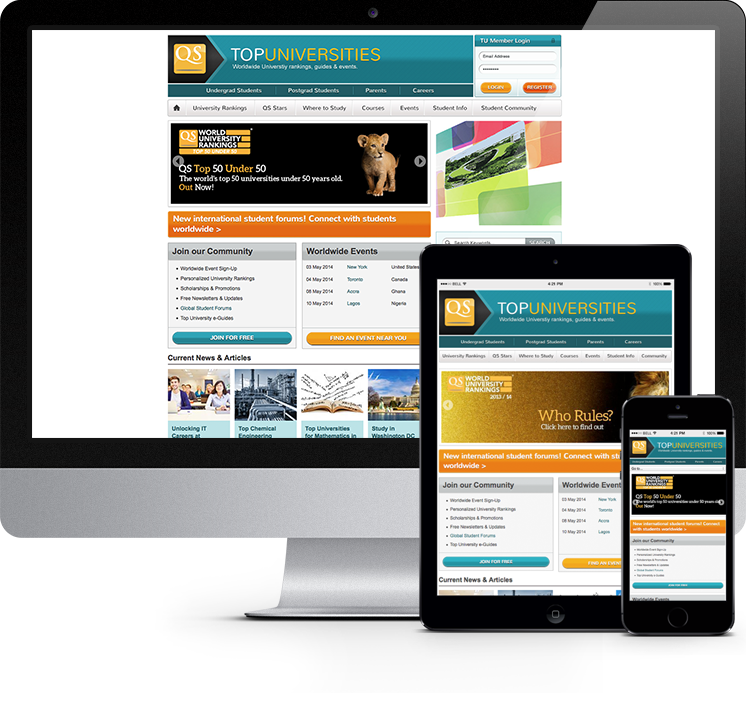 Top Universities needed a fresh new design to their existing web property. Our design team created a best of breed design that the client loved. Drupal Connect built the theme to the approved design specifications and created a flexible and responsive theme that re-organizes the content at various breakpoints. QS needed a method to allow users of the site to be able to login with their existing Microsoft Exchange credentials. Drupal Connect heavily customized the LDAP module to make this requirement a reality. One of the requirements of this project was that QS had built a custom CRM system to capture data when it came in through the website. Drupal Connect built a custom REST call that upon data being entered into the site, the data would be put into the custom CRM in the right places. QS had their blogs built in Wordpress and hosted on a separate domain entirely. Drupal Connect was successfully able to migrate all of the blogs over to Drupal so that the blogs would have the same look and feel that the rest of the site did, and it eliminated the need for the other domain name.